SoMoLO: Mobile is always the first question and answer, everything goes mobile. Local and social, that’s where people are. Google promo for phone on Android, from Hugo Barro. Includes facial recognition for unlocking phone; regular used apps and connection, has social apps – real time updates etc. has widgets, moveable across screens. Widgets allow you to more easily control, via notifications, what is happening across the apps, from the home screen. Spent a lot of time making it great for everyone. They started off thinking phones were like computers, and forgot that they were about people talking. Focused on this in this release. Lots of people things. Taking and sharing photos, can do panoramas, share it easily from screens, from lots of different apps that are hooked into photosharing api. Android Bean is NFC…can easily share between devices…just touch the devices. Has open APIs, so people can build apps on top of it. Every app can respond to an NFC sharing request. Also a way to share apps – if you tap and you don’t have it, then will take you to the apps market. Starting to build out data about inside places, eg Malls, so that maps will work inside places. Eric talked about where we are going. Big scalable platforms, lots of personalised devices with the clouds. Thinking about computing evolution, computers will do what they do well, humans will do what they will do. Computers have infinite memories, solve needle in haystack problems, Phone should remember my trips to Paris, what I have seen, have liked etc. There is an explosion in big data, and phones can learn. Can start doing suggestions based on previous behaviour. What is the impact on countries…it is easy to start a revolution, but the social tools won’t produce a new leader, a new government. Once you have started, with mobile connections, expectations are very high. As Sarkozy told him, it took 100 years for France to stabilise after French revolution,who would wait that long today? One thing he told Sarkozy, is that Silicon Valley needs a competitor. Paris is one of the cities that could compete. entrepreneurship tends to be young, less commitments, more risk taking etc. Cities as this is were these people to be found,. The diversity and ideas is also strongest there. paris has a good shot of this. Politicians tend to nod and listen but take no action; they care about jobs, so we need to do this. Internet is creating new jobs, as its creating new markets for businesses. The role of gov is to make sure citizens have low cost fixed and wireless broadband and citizens will do a lot more. But what about the competition….Eric says Paris needs to get its act together..or move to the US where they won’t give you a visa (as they’re idiots). There is huge race to get on these platforms and own it. It’s a race. Lots of people trying hard. THere are the opportunities. You have to find it. Google+. how is this going. Eric says Facebook is great, a great job. but competition is good. Focused on G+ as opp for more privacy controls, and then Google benefits from the information you provide it (with permission). THe social signal is useful as a ranking signal. 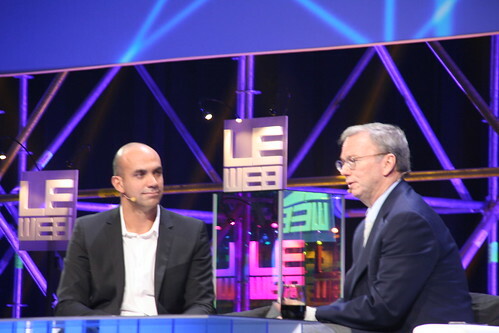 This entry was posted in conference, leweb and tagged #leweb, ericschmidt, google, leweb11 by Rachel. Bookmark the permalink.